Although it has been several years since American Folklore Theatre co-founder Fred Alley’s death, he continues to be an inspiration for many — performers and audience members alike. To honor Fred’s memory, AFT has established the Fred Alley New Musical Fund (FANMF). American Folklore Theatre is the only theatre in Wisconsin, and one of only a few in the nation, the produces original musical works. Up until his death in May of 2001, Fred was AFT’s primary playwright and lyricist, writing such hit AFT shows as Guys on Ice, Lumberjacks in Love, and Fishing for the Moon. Fred’s vision continues to inspire all those associated with AFT. Since 2001, several new book musicals have been created for AFT including – Loose Lips Sink Ships (book and lyrics by Jacinda Duffin and AFT company member Laurie Flanigan, music by James Kaplan), Packer Fans From Outer Space(book and lyrics by AFT company members Frederick “Doc” Heide and Lee Becker), Muskie Love (book and lyrics by Dave Hudson, music by Paul Libman) and AFT’s world premiere show for 2006, See Jane Vote (book and lyrics by Laurie Flanigan, music by James Kaplan). Because of AFT’s criteria for its original musicals, securing authors for shows sometimes proves to be difficult. AFT shows must be of a cultural and/or educational nature that furthers the knowledge and appreciation of local heritage. They also need to be one-act plays that are family friendly. 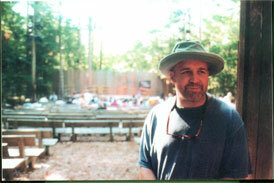 AFT’s Artistic Director Jeffrey Herbst is responsible for identifying and contacting prospective authors. Once an author is commissioned, he or she submits a proposal for the show, and the long process of developing an original musical begins. “The ‘page to stage’ process may take several years,” says Kaye Christman, AFT’s Former Managing Director. The authors have to generate the idea for the show, do extensive research, which may include many interviews with local people, drafts, readings, rewrites – many rewrites. A first workshop is held, followed by more rewrites, readings, and perhaps a second workshop. “In establishing this fund, we are permanently honoring the memory of Fred by ensuring a steady supply of new shows that meet his high standards,” Christman said. To learn more about the Fred Alley New Musical Fund, or to contribute to the fund, please call Holly Feldman, Director of Development, at the AFT Office at (920) 854-6117 ext 105.